A really great team of people running the best wood working facility in London. The instructors have years of experience and heaps of passion that they are extremely happy to share. I would 100% recommend taking a spoon making class or an axe forging workshop! Thanks! Fun class, great teacher and learnt a lot of new skills. Harder than I thought but over the moon with my axe! I learnt spoon carving - it was great and to come away with 2 spoons on the first day! The only drawback (no pun intended) was that no lunch was provided. Well worth it though and watch out as it's quite addictive! A day carving my first bowl taught me so many new woodworking skills earlier this year. A really satisfying project and now I have a beautiful birch wood bowl that is much admired at home. The teaching was methodical, with step by step instructions using new tools for me. 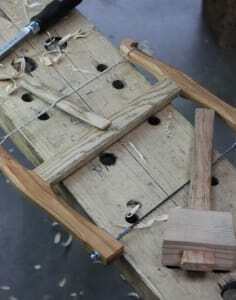 It was also great fun to spend a day in the company of craftsmen passionate about working with wood. 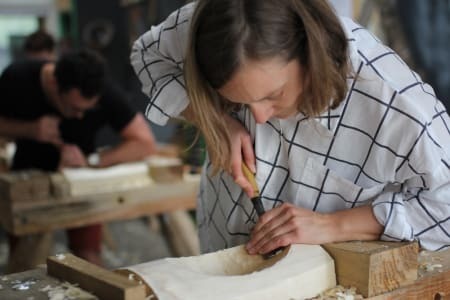 This course was fabulous and left me wanting to carve more bowls (which i have since managed to do!). 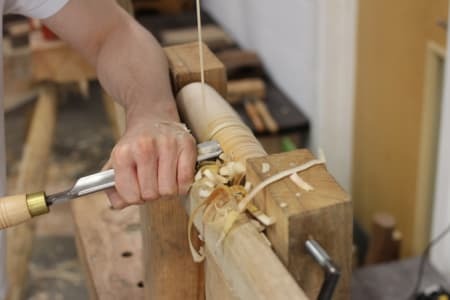 We began with half a 'green' log and were taught how to use gouges, axes and adzes to turn the log in to a bowl using traditional green woodworking methods. The tutor was very patient, friendly and relaxed and took you through each stage of the process step by step. The workshop is a great space within Stepney City Farm and there's a cafe on site, although coffee / tea and biscuits were provided on the course. I was so very pleased with my bowl and would highly recommend this course.